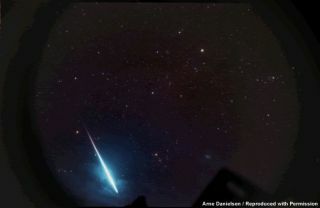 Inthe coming days, skywatchers will likely be hearing much aboutthe impending return of the famous Leonid meteor shower, which gracesthe nightskies of November each year. Whenmost people hear through the news media of an impending meteorshower, it's likelythat their first impression is of a sky filled with shooting starspouring downthrough the sky like cosmic rain. Butthe 2010 version of the Leonidmeteor shower is likely to be far weaker than that. In fact, the general consensuspointstoward rates of 15 to 20 per hour. Inaddition, there is going to be a bright waxing gibbous moon that willseriouslyinterfere with observing the early stages of the display. However,the moon will set a few hours before sunrise when the Leonidsreach their maximum. That?s good timing, as the moon will begetting out ofthe way just as the constellation Leo ? from where the meteors appeartoemanate ? will climb high in the southeast sky. Asfor when the actual peak of the shower will occur, MikhailMaslov, a Russian meteor expert predicts maximum activity at 1511 UT(10:11a.m. EST) on Nov. 17. TheInternational Meteor Organization (IMO) is forecasting that it willtake placea bit later at 2115 UT (4:15 p.m. EST) on Nov. 17, while the 2010Observer?sHandbook of the Royal Astronomical Society of Canada says it willhappen 45minutes later at 2200 UT (5 p.m. EST). Allthree predictions suggest that central and eastern Asia will be in thebestposition to see the strongest Leonid activity. Meanwhile,for North Americans, it looks like it will be a compromise between thepredawnhours of Nov. 17 (with activity on the rise) and the predawn hours ofNov. 18(with activity on the wane). Viewersshould count on seeing about a dozen Leonids per hour ? hopefully more.While afar cry from the meteor storms of a decade ago, it?s still better thannothing! TheLeonids are the cosmicleftovers from a comet known as Tempel-Tuttle. Thesetiny comet particles orbit the sun in a direction opposite to that ofthe Earth.As a result, they hit our atmosphere at exceptionally high speeds: 45miles persecond (72 kilometers per second). The results are very swift streaksof light,some of which can leave persistent trails in their wake lasting formany seconds. Wewill have more to say about the Leonids in the days ahead, and on Nov.15 we?llpublish a complete guide on how to watch for them. So stay tuned ? Joe Raoserves as an instructor and guest lecturer at New York's HaydenPlanetarium. Hewrites about astronomy for The New York Times and other publications,and he isalso an on-camera meteorologist for News 12 Westchester, New York.